QUEBEC CITY (CNS) — “Really?” Cardinal Gerald Lacroix, archbishop of Quebec, recalls the reaction of people when they learned that the Anglican bishop of Quebec was living with him in the Episcopal Palace. For a little over a year, from May 2016 to July 2017, Bishop Bruce Myers of the Anglican Diocese of Quebec lived with the cardinal. The Anglican bishopric, located a few blocks away in Old Quebec, was occupied by Bishop Dennis Drainville, the outgoing bishop. He asked his friend Cardinal Lacroix if he could house his successor, Bishop Myers, for a while. The arrangement opened an unexpected new chapter in a long tradition of friendship between Quebec City’s Catholics and Anglicans. “I shared moments of prayer, daily meals, social life. I felt completely integrated in the life of this residence,” Bishop Myers said. “He was one of us, one of our family,” Cardinal Lacroix added. The complicity between the two men is striking. They often prayed together. And when Bishop Myers attended Mass, he refrained from receiving Communion, respecting the Catholic teaching and tradition. “I received the Eucharist spiritually with my confreres,” he said. “For me, it was one of the most important moments of each day, to be present, even if I wasn’t able to receive the Blessed Sacrament with my confreres. “It has given me every day a little momentum toward reconciliation, more energy toward the day when we can gather at the same table of the Lord and share the same sacrament. It’s a manifestation of the real but imperfect communion between our two churches. Being present, for me, is a testimony to communion and visible unity,” he explained. The two men often were seen together at the archbishop’s house, but also during celebrations at Notre-Dame of Quebec Cathedral and the Anglican Cathedral of the Holy Trinity. In 2016, the Anglicans even inaugurated a unique cathedra specifically reserved for the Catholic archbishop of Quebec. “It’s not a matter of just praying by looking at each other from a distance. We share the prayer. There is a good chance, if we get closer to the Lord together, that there are steps that will be made,” said Cardinal Lacroix, who said Pope Francis was happy to learn about his friendship with Bishop Myers. Bishop Myers then pointed to his pectoral cross. “Today, I wear the cross given by Cardinal Lacroix and the two auxiliary bishops of Quebec. It’s a gift of enthronement they found for me in Rome. It was blessed by the Holy Father,” he said. 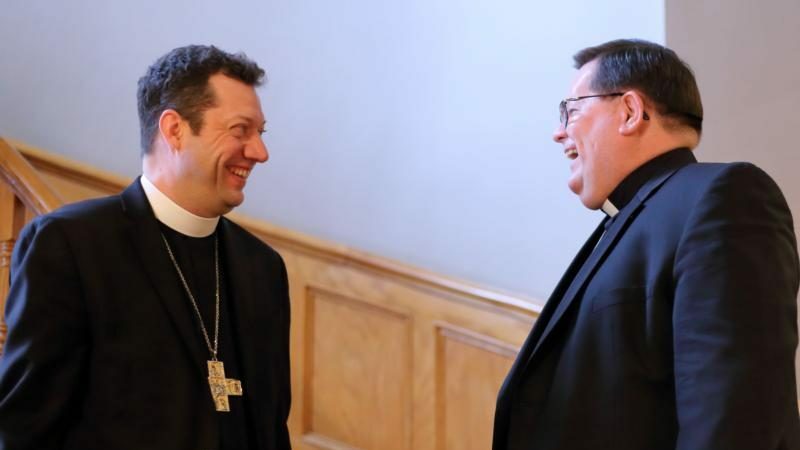 The two bishops shared parts of their daily routine but also learned from one another. In that respect, Cardinal Lacroix said he is particularly appreciative of Bishop Myers. Bishop Myers noted that he benefited from hearing details about the ongoing reflection within Quebec Catholicism on the challenges of Christianity in today’s world. “I received a great episcopal formation from my neighbors,” he said. In terms of ecumenism, the two religious leaders are convinced that unity will not come from a decree, but from experiences shared among people. Still, they recognize the importance of dialogue and ecumenical exchanges. Prior to his installation, Bishop Myers worked on ecumenism for the Anglican Church of Canada. He added that he observed a difference in attitude among Anglican worshippers since the inauguration of the archbishop’s cathedra at Holy Trinity. “You’re seen in the cathedral almost as often as me. I see how people greet you: as a neighbor, as a friend. And that’s exactly what you are here,” Bishop Myers told the cardinal. I became a Catholic in part because the Episcopal Church has long since ceased to believe in the sanctity of human life and a sacramental understanding of marriage. Anglicanism has been a path to Rome in no small part because of Blessed John Cardinal Newman, Msgr Benson and Msgr Knox. Then of course there is Anglicanism Coetibus, the Holy Father Emeritus’ great gift to those of us from the Anglican tradition. None of this is noted in any of the news stories I’ve read.